A lot of mileage covered this week and not enough decent food eaten. In case I had any doubt before, I have confirmed that this army definitely marches on her stomach and gets grumpy if she doesn’t eat good, cooked food regularly. I seemed to be rather unlucky this week with pubs and cafes being closed, or not serving food, or just being plain rubbish. I not ate 4 decent cooked meals this week and it definitely affected my morale. Whilst on the subject of food, I’ve also learned on this trip that nothing beats a cooked breakfast; porridge doesn’t come close and cereal is not even worth a mention (even frangipane tarts that have so many chemicals in them they never go off beat cereal). The weather turned cooler and a lot windier this week, and this made the walking harder. 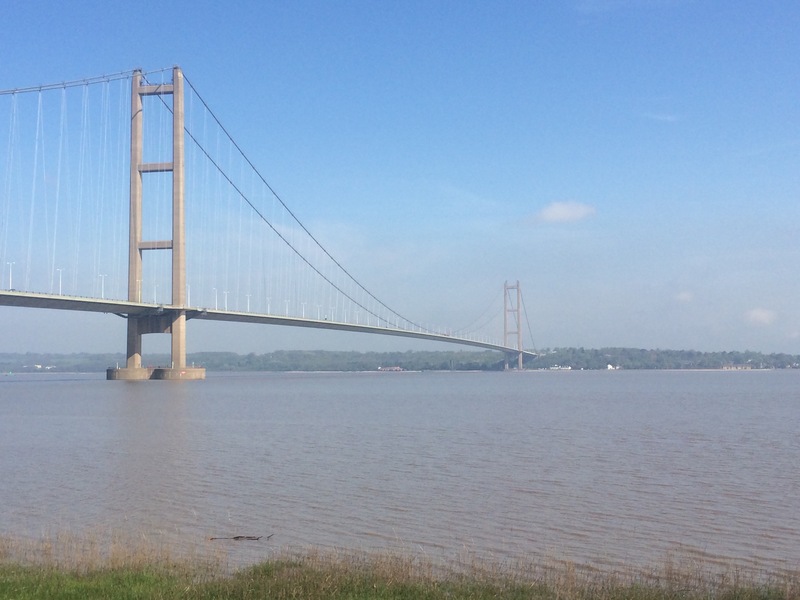 The main feature of the week was without doubt the Humber, with its industry, wildlife and a fantastic bridge. There were a lot of power stations that I passed this week, and lots of industrial output. Every guest house was full of contractors so people are busy in this part of the world, just not necessarily the people who live here permanently. My main conclusion for this week has been that as someone who’s not that fond of people I’m amazed how much this trip is becoming about the people I meet. I thought it would be all about the places I visit, but the places have even been usurped by the walking at points this week. I need to keep a balance so the walking is just the means to see the places, and then I’m happy if the people I meet make the places special. Thanks to all the lovely people I’ve met this week, without whom I would have had a tougher and less interesting time. An extra early start this morning. 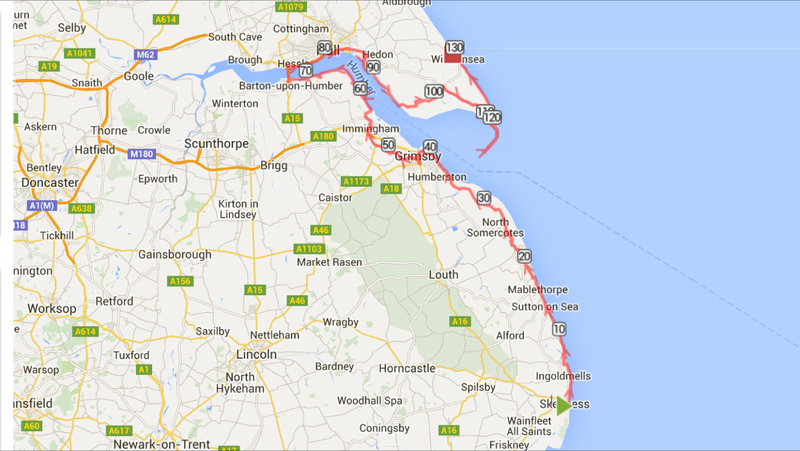 By 6.30 am I was setting off to walk the 9 miles to Spurn Head and back before breakfast. It was nice to be carrying nothing for once; I felt so light. It was a chilly, breezy and grey morning so the views across the mouth of the Humber weren’t as good as they might have been but the trade off was the early peace and quiet. 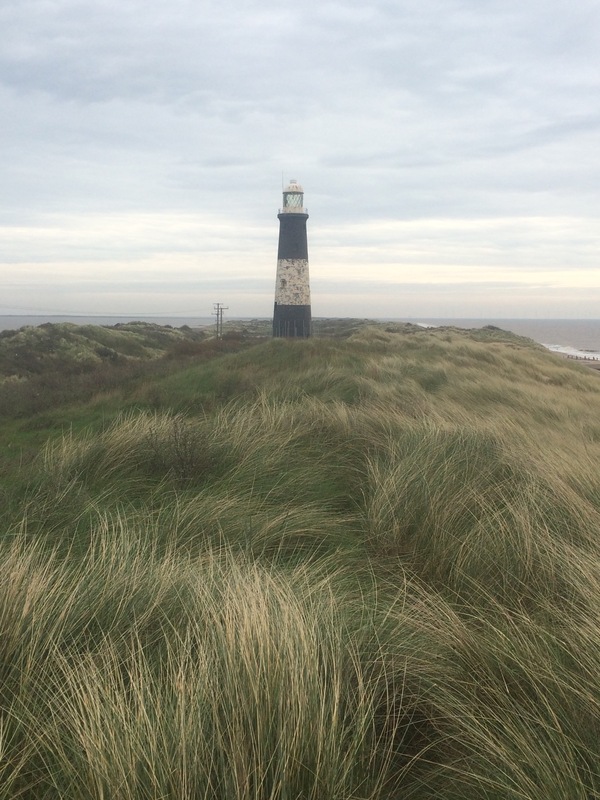 Spurn Head is another important nature reserve and I saw 3 heligoland bird traps (like big cages) where migrating birds are caught and ringed. There were no birds in them. 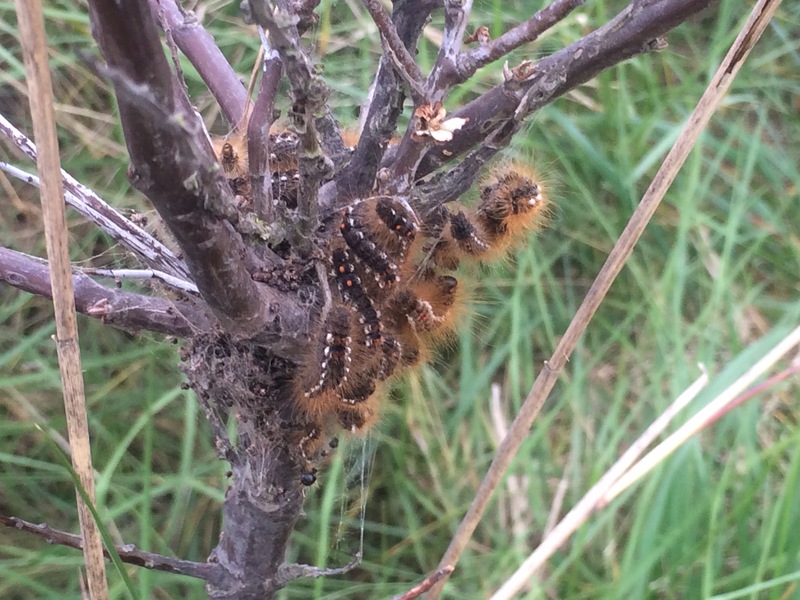 There were lots of signs warning about the brown tail moth caterpillar, which apparently can cause skin irritations. There were millions of these creatures, some of them trying to hitch a ride on my boot laces! Many were in large clumps on the spiky bushes. 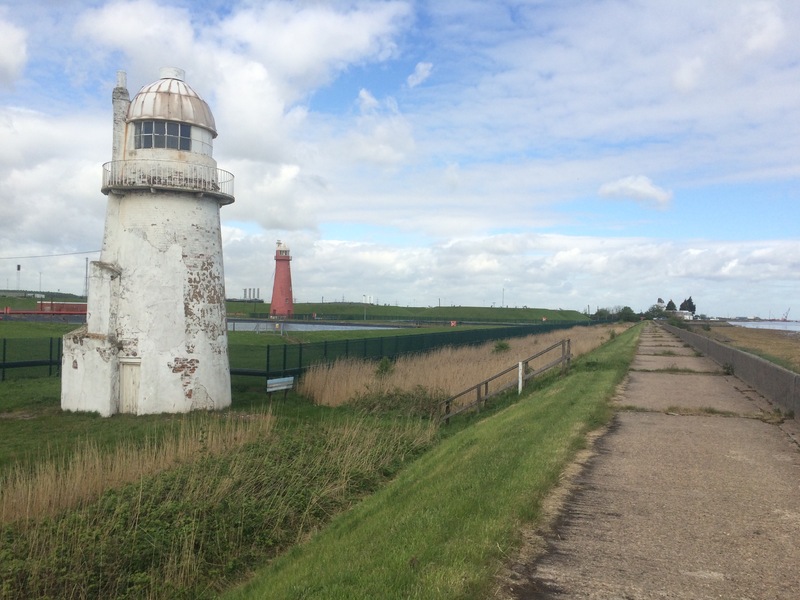 Matthew’s lighthouse is not quite at the tip of Spurn Head and isn’t yet open to the public (Yorkshire Wildlife Trust are working on it) so I carried on to the only permanently manned UK lifeboat station, where the new shift was arriving. Six days on and 6 off, not a bad rota. I stumbled around through the thick undergrowth and ruins of a military fort trying to find enough height to get a view, it was difficult. After half an hour wandering around I headed back before high tide when there is a risk of getting wet feet. 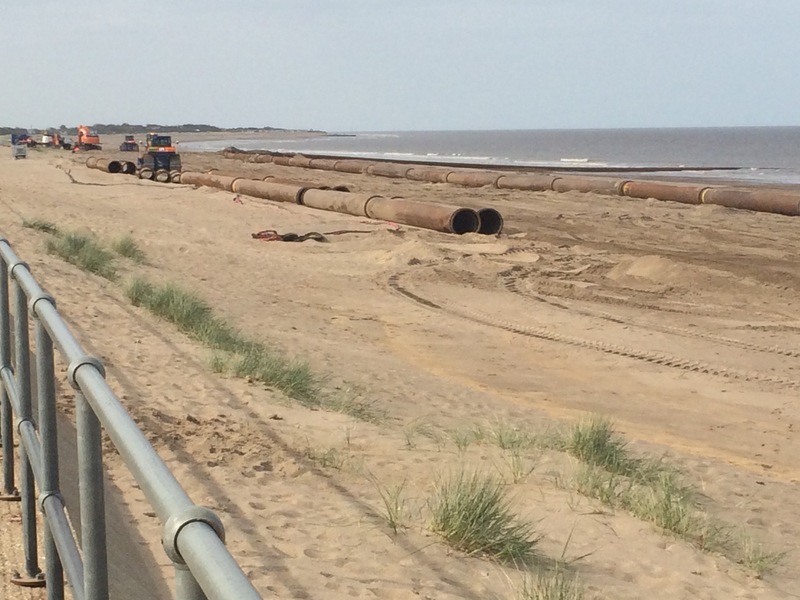 The road has been washed away (I presume in the December 2013 storms) and it’s evident that Spurn Head is moving West relatively quickly. In fact I was surprised to read that the Holderness area (This part of the Yorkshire East coast) has lost 14 settlements to the sea in recent times. Kilnsea used to be further East not that long ago and the road still heads into the sea. I packed up my tent and headed to the Bluebell cafe for a late breakfast. Yet another culinary disappointment to add to this week’s long list. The ladies working there are indignant that the Yorkshire Wildlife Trust are kicking them out but I think it’s a good move. The rows of Nescafé tins from whence my coffee came and my microwaved poached eggs served with a side salad were less than appetising. By now Kilnsea was filling up with birders carrying huge telescopic cameras on equally huge tripods. 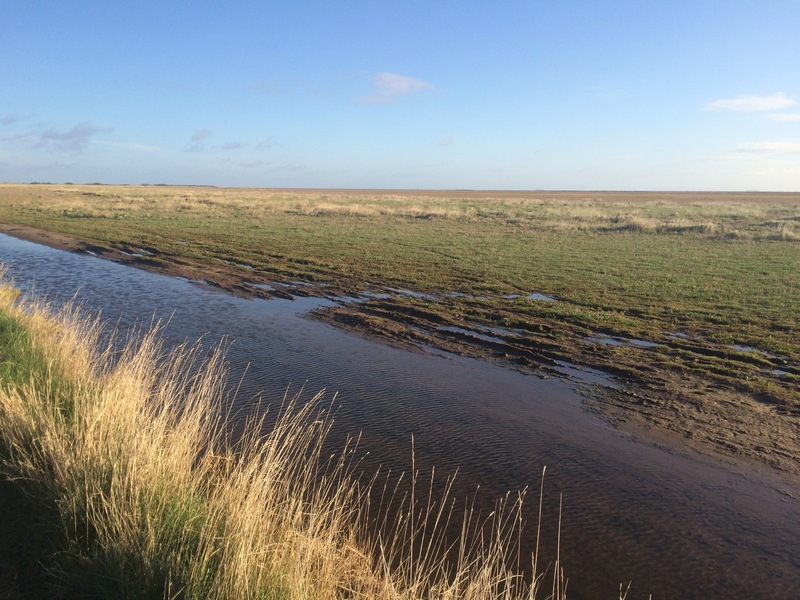 I learnt that Spurn is a great place to spot summer migrating birds because they fly North over the land following the coast (quicker than I’m going) and when they get to Spurn they carry on following the coast and so start heading South by mistake. Being a thin strip of land Spurn funnels them all into the birders’ field of view. Simples. 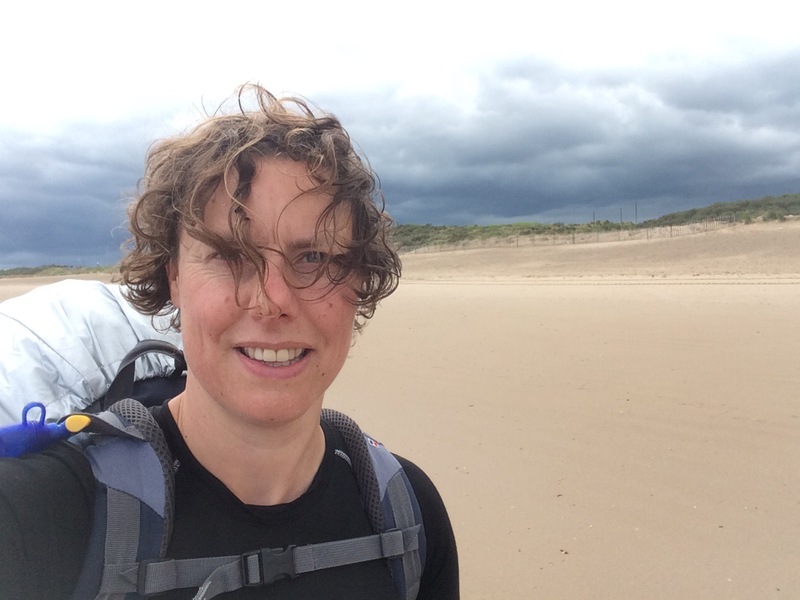 Ignoring all the advice I received from the locals last night (no one could agree which bits could be walked on beach, cliff or road) I walked all the way from Kilnsea to Withernsea on the beach as the tide was receding and there’s no cliff path (it’s now in the sea). There were lots of fishermen to avoid but they weren’t having much success. According to Keith in the pub last night they were on the wrong side as the Humber is full of codlings at the moment. 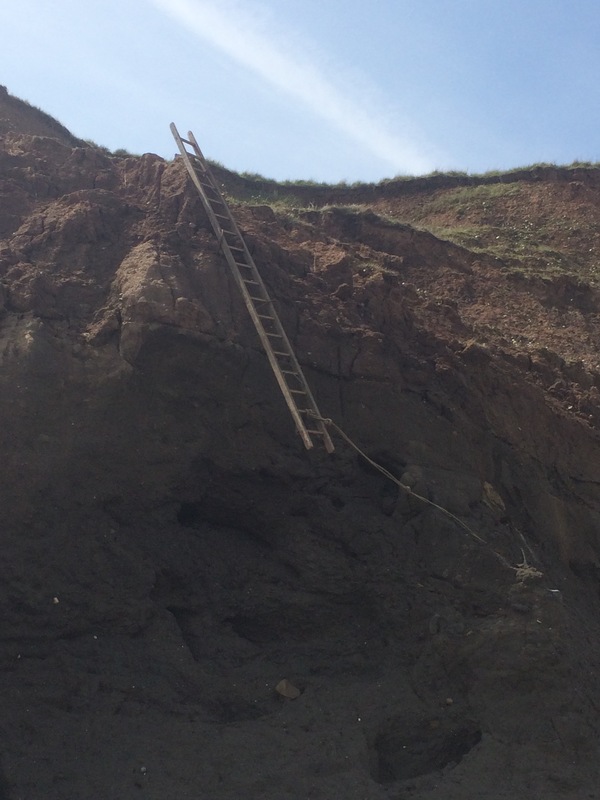 I’m not sure about this route off the beach! 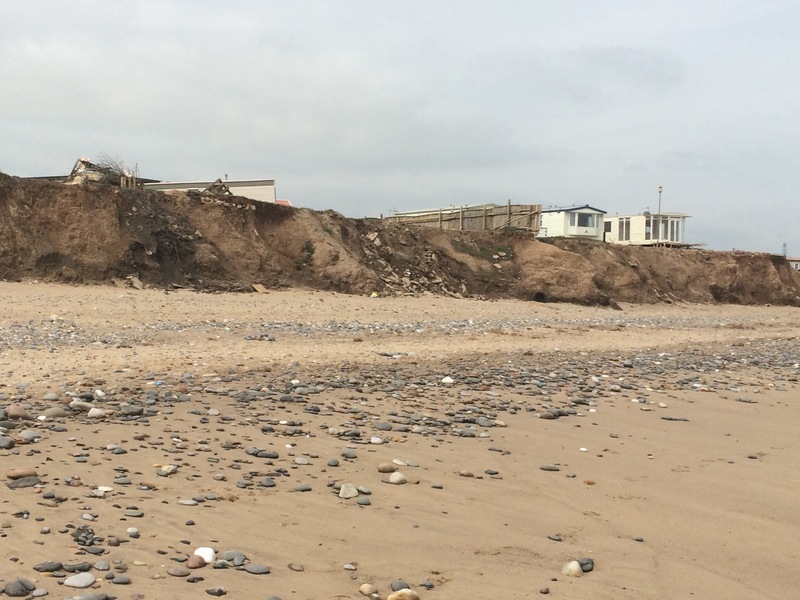 Withernsea is a popular little resort with a huge concrete sea wall. I found a great little cafe and felt much better when I finally had some decent food inside me, and a decent coffee, and cake, and an ice cream. I was hungry. I was staying at a Park Resorts campsite (same as Kessingland) where they have hundreds of static caravans and a couple of touring fields. I was shown where to pitch my tent by Sandra, the camping warden. She chatted to me, fed me coffee and biscuits, offered to lend me a towel to save me getting mine wet, gave me some washing powder so I could use the launderette and printed me off some bus information. She also cleaned the shower block for me. What a star. I spent the evening planning (no change there then) in the clubhouse listening to the bingo and the children’s entertainer. All very Butlins. 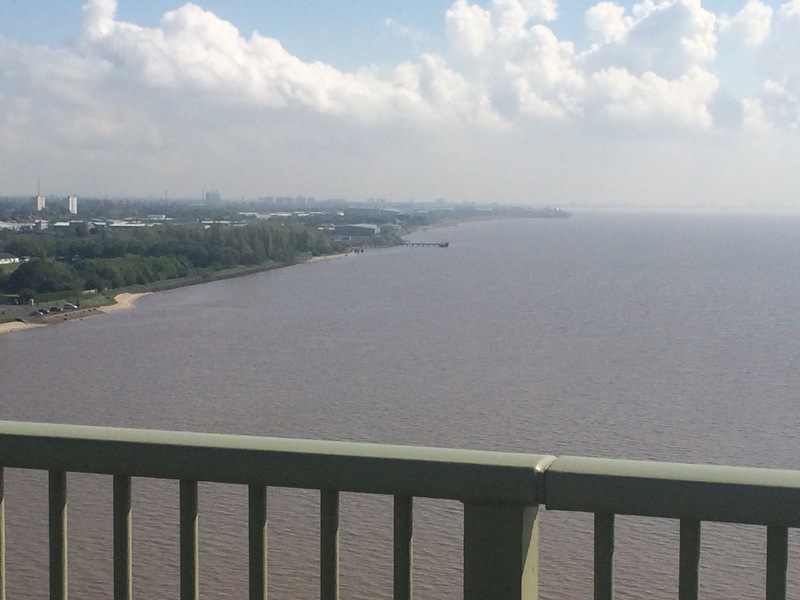 Day 34 The Windy Humber! I was disappointed with last night’s B&B. Now that I’ve stayed in a number of guest houses I feel like I’m getting a feel of what I should expect for my money and Paull Holme Farm was wildly overpriced so I was annoyed. My main gripes were the state of the mattress (if they paid more than a tenner for it they were overcharged) and the lack of a breakfast. For £45 I expected more than a DIY continental breakfast. They had free range chickens and not an egg in sight for guests. I felt cheated. Still, this is the only place I’ve ever stayed with a flood assembly point. 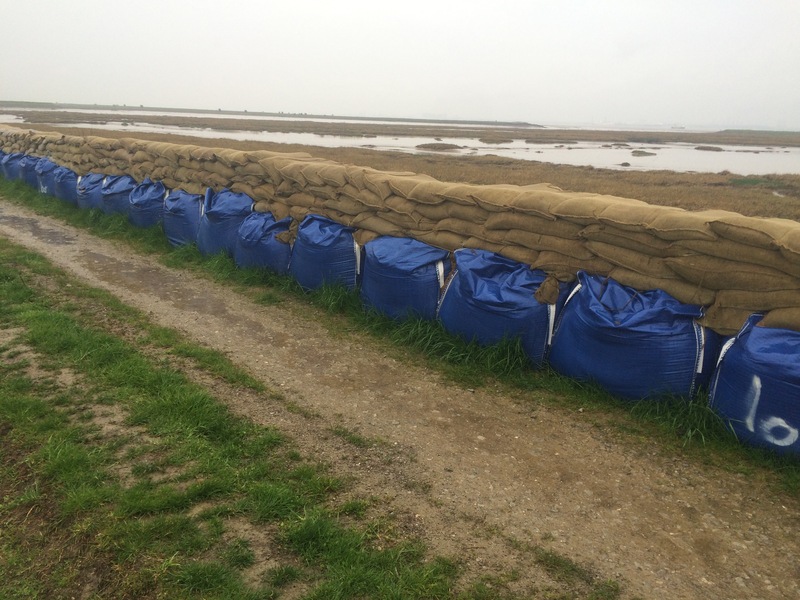 Yet more proof that the flood defences need bolstering I guess. 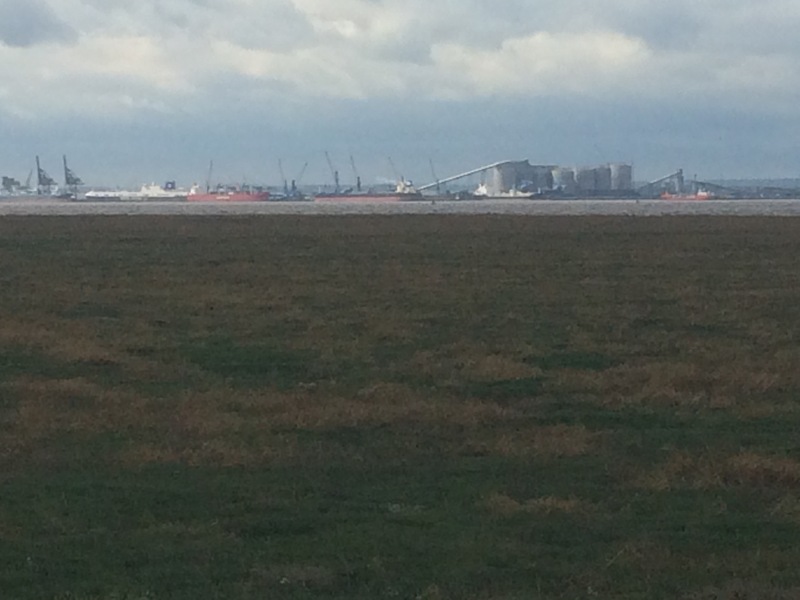 I set off along said sea defences with good views across the Humber to the power stations I avoided in Grimsby. The walking was made difficult by the strongest (and unforecast) winds I’ve experienced to date. Even with my outriggers I was struggling to stand up. It was so bad that when I reached the small harbour of Stone Creek I decided to walk inland to the town of Patrington and get a bus. It meant a few miles on the road but so be it, I couldn’t lift my head long enough to look at the view on the sea wall anyway. I did see a deer and a heron but other than that there wasn’t much to look at. Just as it started drizzling I arrived in Patrington and headed straight for the only cafe I could find that was open (I had already past a pub and a cafe that were closed). A quick refreshment was in order before the bus arrived and whisked me to Easington. From there it was another 3 miles to Kilnsea and half of that was along the river again with great views of Spurn Point. Fortunately the wind had calmed down a bit. I arrived at The campsite in good time to pitch my tent, grab a shower and head to the pub. Would you believe it, the pub that does food 365 days of the year had a staff shortage and wasn’t serving food. This keeps happening to me! I couldn’t believe it. I was tipped off that the caravan park might serve food in their cafe so that was my only hope. Well I managed to get something to eat, although it wasn’t what I was hoping for. I had an Angus beef burger and a baked potato with beans (safest things I could find) and they were served to me in 2 styrofoam cartons…maybe they’d run out of plates? The people were lovely and everyone in the whole place was interested in my trip and helping me with tide times and the like. Once I’d eaten I went back to the Crown and Anchor pub for another pint, wifi and a power socket. The people there were also lovely and Jean even sorted me out some sticky toffee pudding, so it all worked out in the end. To top it off the sun came out and there was a lovely sunset with the lights of Grimsby glowing from across the river. I knew it was going to be a long day so I set off as early as possible on a damp and misty morning, which meant packing my tent away damp. Unfortunately breakfast was a measly banana and some disgusting frangipane tarts from the local corner shop; I managed 2 and threw the 3rd to the birds. I felt slightly guilty at the thought of potentially poisoning the poor birds. 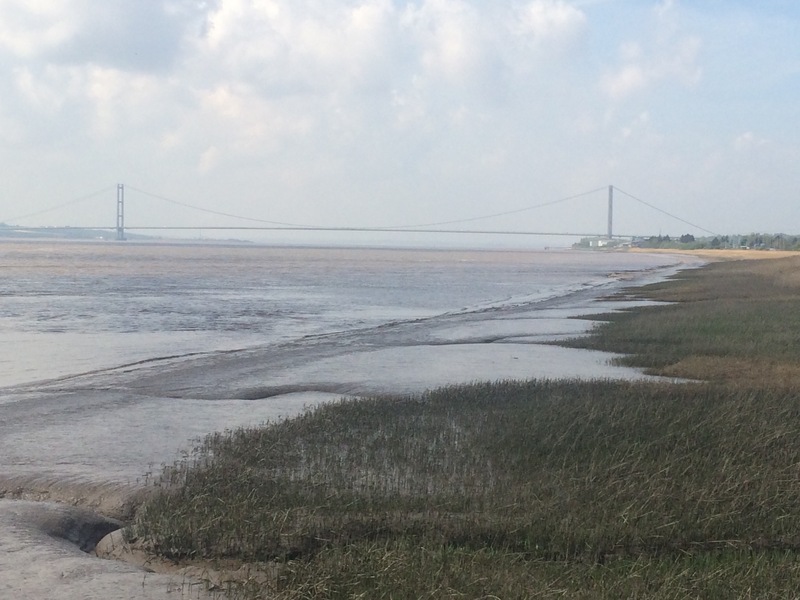 The walk from New Holland to Barton Waterside is lovely, with the river on one side, old clay pits that are now flooded and a nature reserve on the other and, of course, the Humber Bridge looming larger with every step. Very peaceful when you block out the drone of traffic from across the river in Hull. I walked through Barrow Haven Old Ferry Wharf, carefully avoiding all the forklift trucks carrying wood from the docked ship. By 10am the sun was out and I had arrived at the Barton Waterside Inn, which dates back to 1715 and was where the London stagecoach dropped its passengers to get the ferry across the Humber from Barton to Kessle. This is also the start of the Viking Way, a recognised walking route from Barton to Oakham. With a bit of looking I found the footpath up to the walking/cycling path across the bridge. Who needs the Sydney Harbour Bridge? This one is magnificent. I did note the Samaritans poster but I was in no mood for jumping. The bridge was only opened in 1981 so before that it was either the ferry or the long way round. 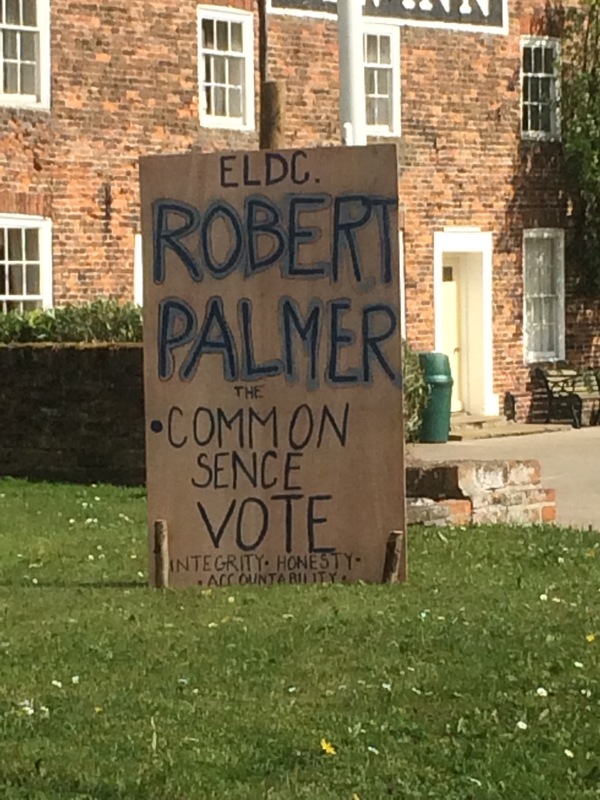 So I left Lincolnshire behind and entered East Riding of Yorkshire. 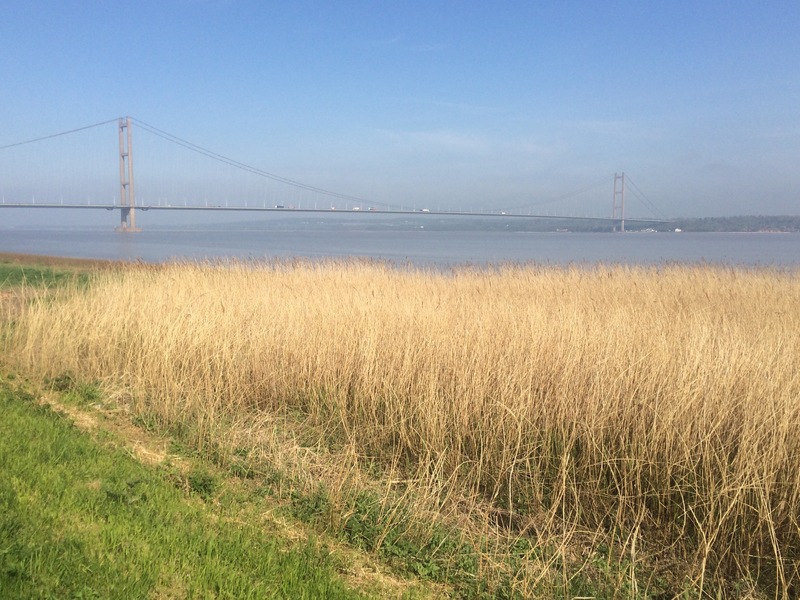 I was following the Trans-Pennine Way along the Humber foreshore into Hull; however, the signs disappeared in places and some parts of the walk were not great. At one point I had to cross a derelict lock gate where vandals had already pushed the barriers out of the way. Fortunately it didn’t collapse and the smack heads on the other side offered me (slightly incoherent) directions to get back on track. I was a bit lost wandering through the industrial area and so stopped for a quick cup of tea and a sandwich at a greasy spoon. I love these places. Eventually I reached the Marina and Victoria Dock, the smarter bits of town where Hull is advertised as a great destination for a weekend away. I can believe that from what I saw, just be selective and don’t go for a week. It was here that I met Raymond. He was watching the new college being built (something he does for a few hours every day) and asked me where I was walking to. When I said Paull he pointed out that the path along the foreshore was closed by the docks and so he took it upon himself to ensure I found my way. He walked with me for an hour and without him I would have got lost. Seriously, why would a council close the old path a month before it opens a new path? My timing was not good in this regard and without Raymond I’d have been stuck. He was a lovely man and also enjoyed long distance walking, but he was not someone many people would chat to as he clearly had a few challenges. At one point he went into a shop and asked the shopkeeper to write his name and address down to give to me with the request that I write and tell him when I finish my walk (I explained this would be next year). He really brightened my afternoon, particularly as the diversion involved 3 soul-destroying miles alongside a dual carriageway. When he left me I had very thorough instructions of how to get to Paull that had been repeated many times over. He even thanked me for trusting him, which was ridiculous because without him I’d still be walking. I rounded yet another large gas works, the Saltend works that celebrated 100 years of innovation in the field of transportation fuel in 2014. Finally Paull was in sight and I was able to leave the road and walk once more by the river. I was hungry and my feet hurt from so much road walking so decided to stop for food in Paull before tackling the final 1.5 mile to my accommodation in the middle of nowhere. There were no shops for me to buy something to cook in the communal kitchen, but there were 2 pubs. The better looking pub had an hour until service but the other pub, the more rundown one, was serving food so I went in and was rewarded with an excellent home cooked meal; possibly one of the best meals of my trip. 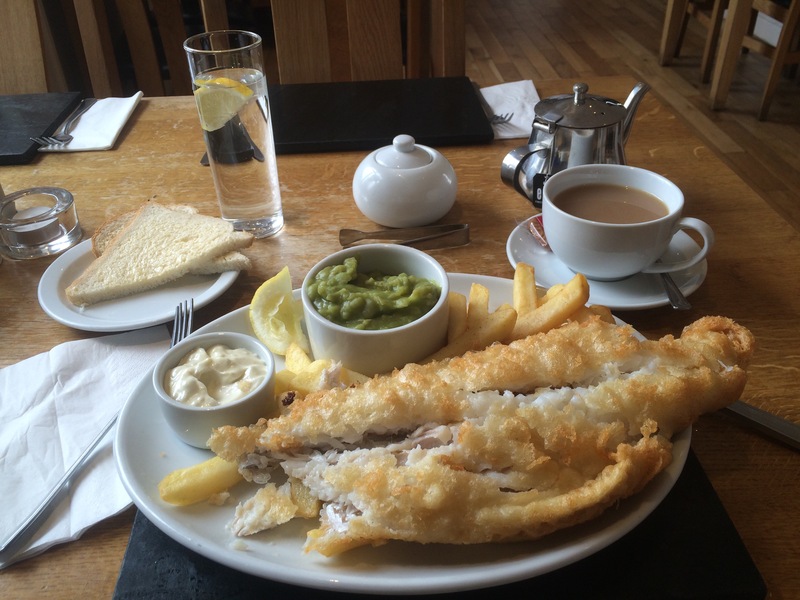 If you’re ever in Hull take a 10 minute drive out to Paull and you’re guaranteed a good meal at the Humber Tavern. 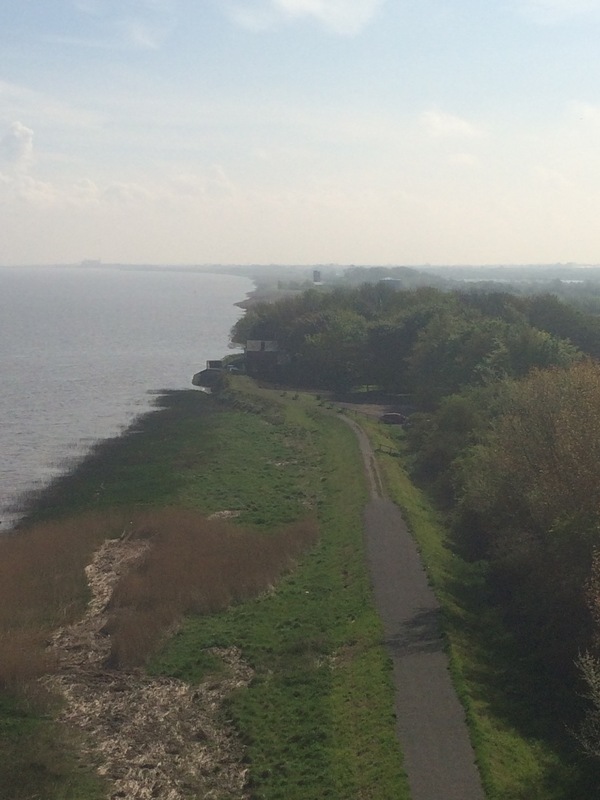 You could even visit Fort Paull while you’re there. 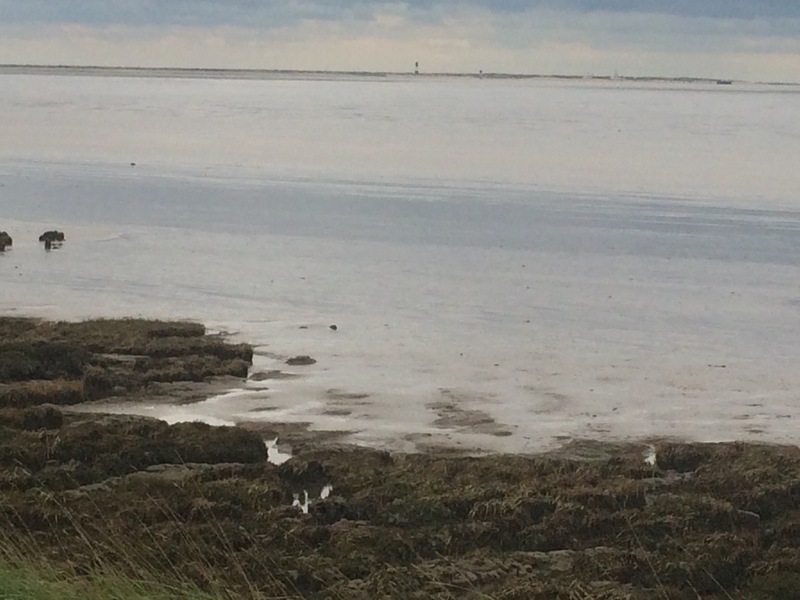 An hour and a half later the rain had set in and I had a wet walk along the edge of the Paull Holme salt marsh sea defences to my B&B. I still had plenty to do with clothes washing and tent drying (room looks like a bomb site). I reflected on the long day and decided the moral of today has definitely been that I shouldn’t judge a book by its cover! I decided to get the bus around the industrial power stations and works that litter the Humber coastline to the West of Grimsby. When I got off the bus I only had one power station to negotiate around and that was difficult enough. 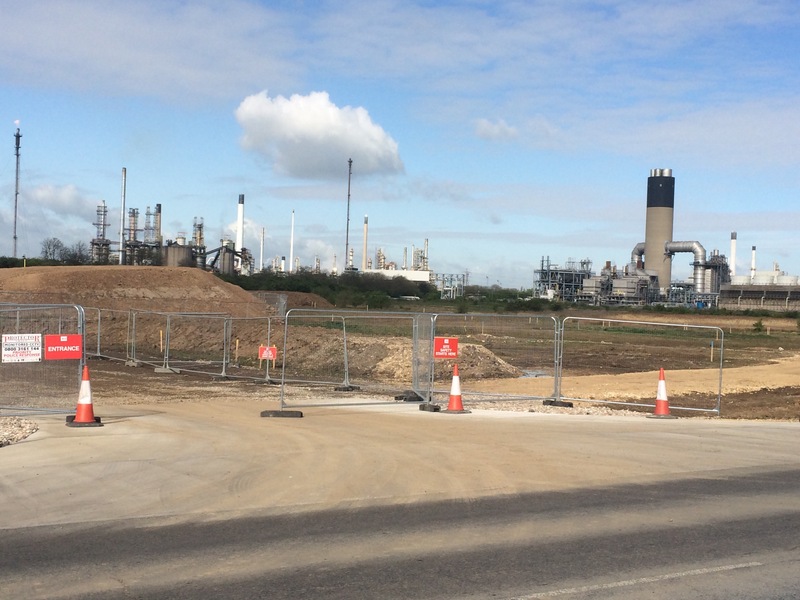 I first walked through Immingham and the lovely little kids park with the nature trail and its bug and bird houses, then along a dual carriageway and finally down the minor roads leading to the power station. It was here I feared for my life as the lorries came hurtling past and I kept having to brace myself to survive the shock waves that followed them. I made it onto the concrete footpath along the river bank and in the middle of so much industry; it had its own kind of beauty. 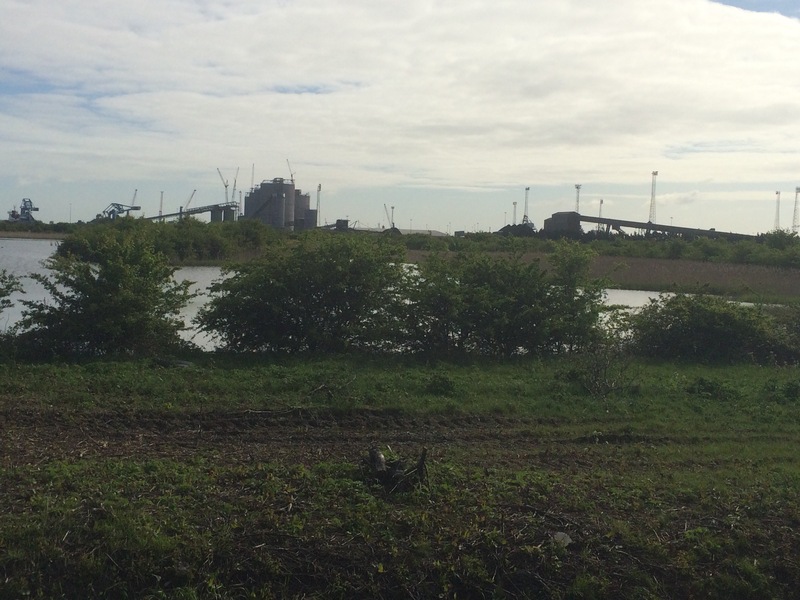 As soon as I got past the rumble of all the lorries and heavy machinery a strange quiet descended and once again I could hear all the birds, who seem to like places like this where they are generally undisturbed. Not a day goes by that I don’t see oystercatchers, and I’ve also seen plenty of kestrels and egrets, as well as a few waders dotted about. It was a long and solitary walk along the concrete sea wall but it was pleasantly warm and a lot less windy than the last couple of days. 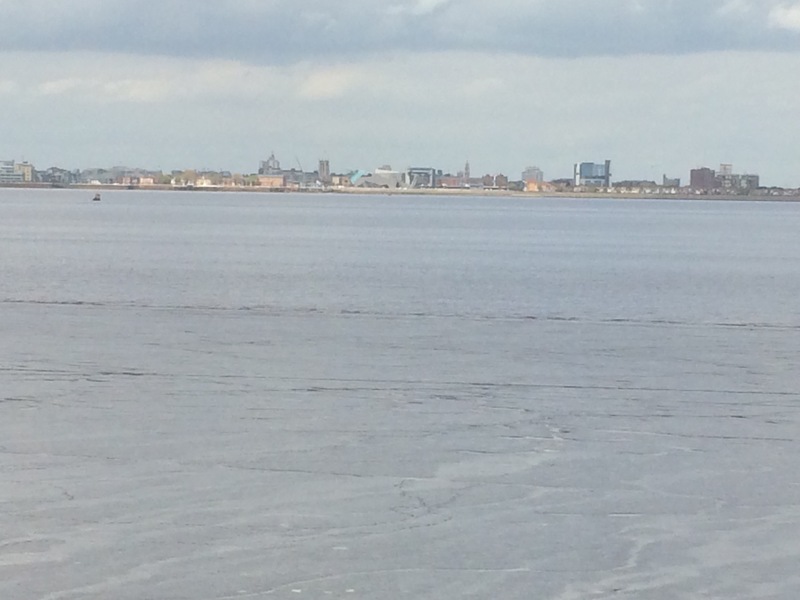 I got a good view across the river at Kingston Upon Hull (sounds much grander than plain old Hull). 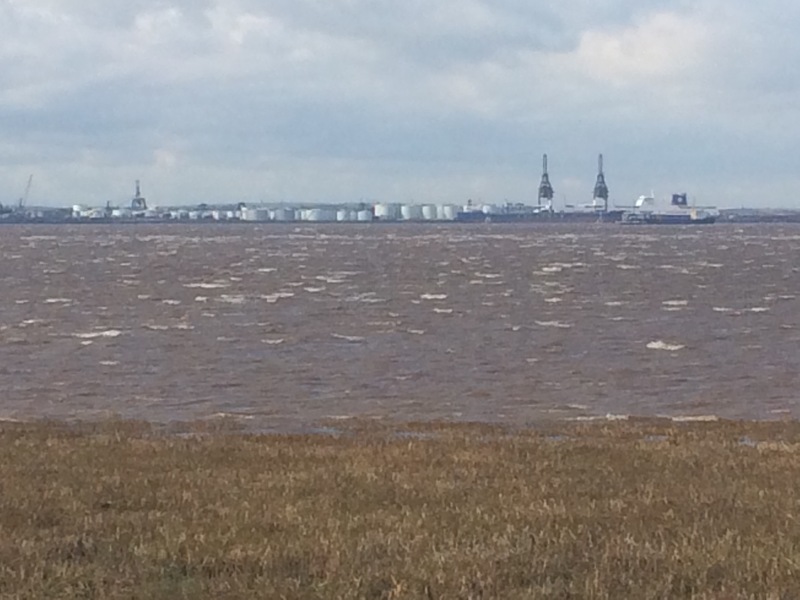 I think today I saw at least 4 power stations (on both sides of the river), numerous towers, pipelines, ships and walked through the container port that is Humber Sea Terminal. A very industrious walk. Back to camping tonight. Arrived along with the rain so pitched and then lay in tent for a while wondering what to do next. Nearest pub without a guaranteed fight(!) was 1.5 miles away, or else it would be take away Chinese. I opted for the walk and was rewarded with steak-night, wifi and Timothy Taylor’s Landlord beer. Glad I made the effort, particularly when I realised it had been 30 hours since my last decent meal (sorry Franco but the cereal didn’t cut it). A really early start this morning to try and beat the rain meant full cooked breakfast at 6am and on the road at 6.30am. This ensured at least a couple of hours of brilliant blue sky and sunshine as I made my way along the edge of the mud flats to Donna Nook with just the birds for company. 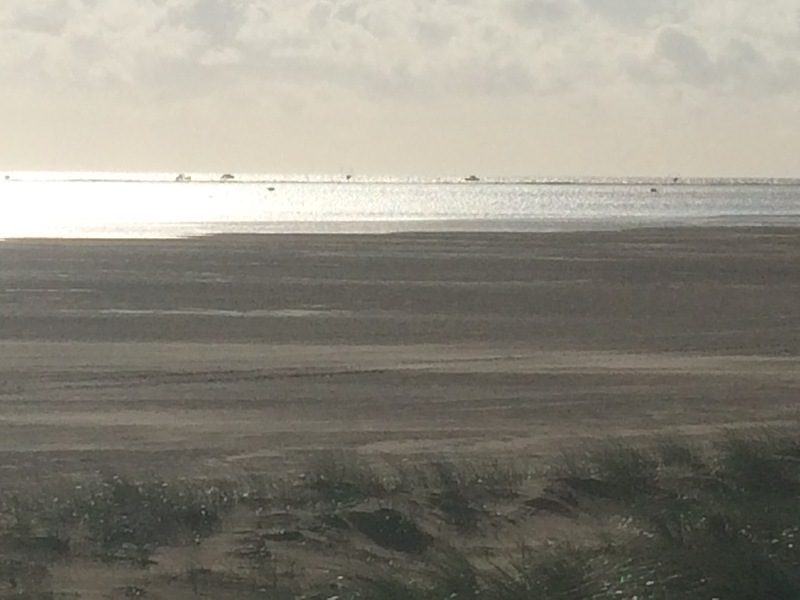 At times it was difficult to see the sea; it looked so far away across the samphire beds and the flats. It didn’t take long for the MoD warning signs to appear telling me not to stray into the bombing range. Donna Nook is well known for 2 things: the RAF bombing range and the huge seal colony (according to Alan from The Crown there were 1500 seal pups last year). I could easily spot the bombing range targets, which included fake tanks made of wire and netting, but the seals were harder to see as they looked to be at least a kilometre away near the shoreline. I decided not to venture out to see them. There are enemy tanks in the sea! 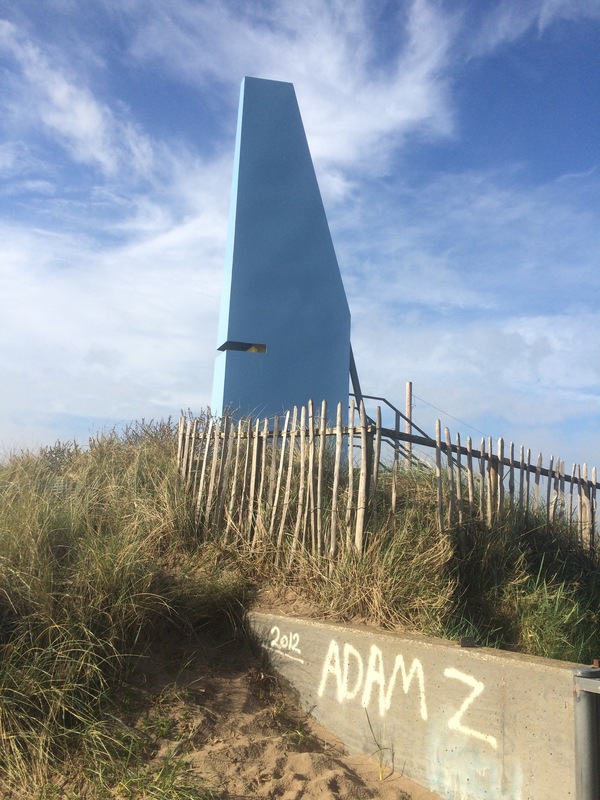 Aliens have landed at Donna Nook! From Donna Nook the coastline starts turning West towards the mouth of the Humber and I could see the lighthouse at Spurn Head. The next 7 miles were all on sea wall and the wind was starting to gust as strongly as yesterday so that made the going harder, and less of a straight line! At 0958 (according to my civilian watch) the RAF started bombing Donna Nook but I was already long gone. I watched a couple of jets dive down from the clouds and then climb up again quickly, but it was difficult to stand still in the wind and to see the aircraft with the clouds now covering the sky. The rain came at 11 am, just as I reached Humberston, and I donned full waterproofs for the rest of the day. I walked past the village of pre-fab houses and arrived at the miniature steam train station at the same time as a train. What luck. 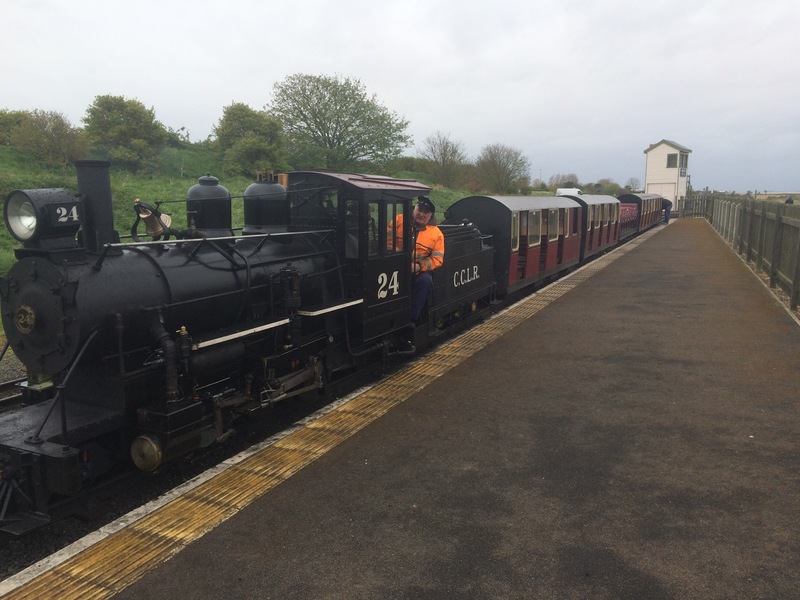 No sense in walking 2 miles in the rain if I can get a steam train along the front. I found out afterwards that I missed the Northernmost point where you can stand straddling the Greenwich Meridian, but instead I had a good chat with Geoff the train driver and 2 policemen, and got a tip for great fish and chips. I was happy with the trade off and made my way along the Cleethorpes sea front to The Captain’s Table for the best fish and chips in town. 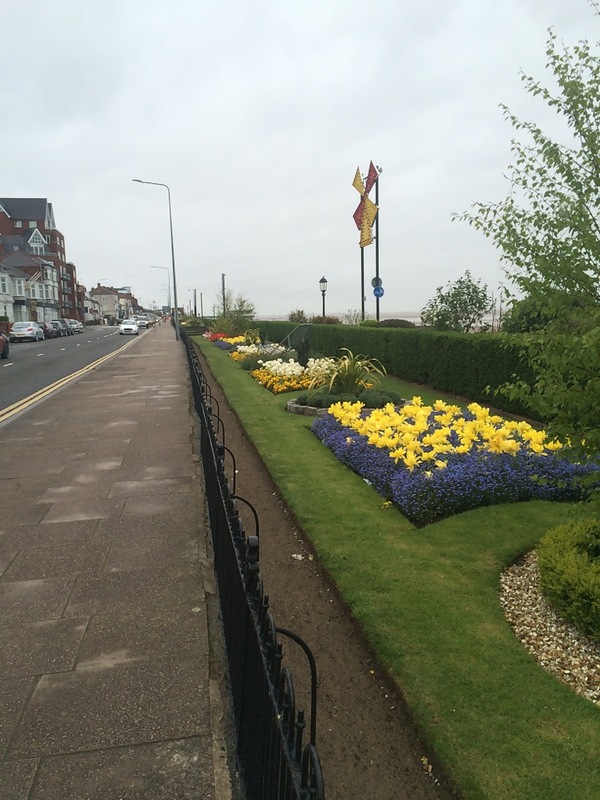 Cleethorpes likes the Britain in Bloom competition and I would definitely vote for it. The best flower beds I’ve seen so far by a country mile. After lunch I carried on to Grimsby having decided that camping in this weather was not going to be fun (besides I’d already passed my campsite on the train) and there was bound to be some accommodation in Grimsby. Four hours later I landed at The Pink Butterfly B&B where the Italian owner, Franco, made me a cup of tea and told me there is a shortage of accommodation in Grimsby. I was lucky. I had walked for miles through the town but hadn’t really seen a lot. Every cafe I found was boarded up yet I saw lots of houses being renovated. I know the rain didn’t help but it’s not the most attractive town. I walked to the Fish Dock but later found out it’s been many years since any catches were landed there, these days it’s full of fish processing factories owned by companies like Youngs and Birds Eye and the fish is brought in on lorries from Scotland. What a shame. 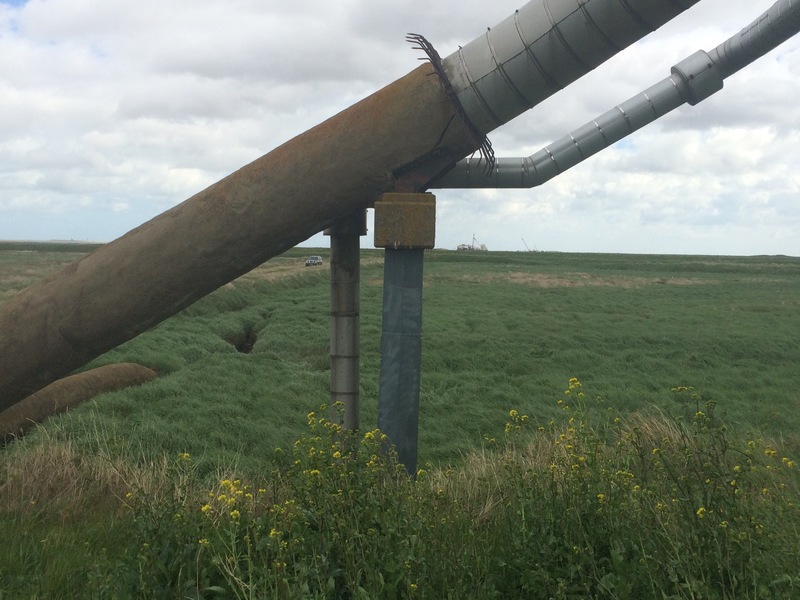 All the industry now comes from the many power stations and wind farms (most guest houses up the Lincolnshire coast seem to be full of contractors, leaving few rooms left for coast walkers). It seems this area is an entry point for undersea crude oil pipelines, one of which I walked underneath earlier in the day as it rose out of the ground into a bridge over the sea wall. I left Chapel St Leonards before breakfast in order to try and get ahead of the predicted rain. The walk along the beach all the way to Sutton-On-Sea was lovely. I saw 2 seals; one was dead on the shoreline and the other was lying in the surf eating a rather large flat fish of some sort, reminding me I needed breakfast. Just as it started to rain I reached Sandilands and a sign for a cafe. I was straight in for an egg banjo (fried egg sandwich, with sausage) and a coffee; make that 2 coffees while I waited for the rain to pass. 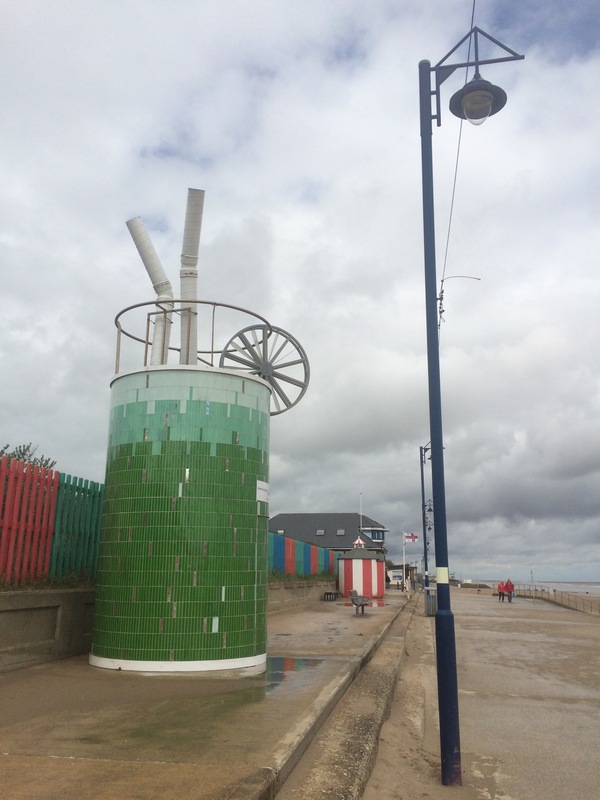 Along this part of the Lincolnshire coast, right through the resorts of Sutton-on-Sea, Trusthorpe and Mablethorpe, are several architect-designed constructions called structures on the edge. 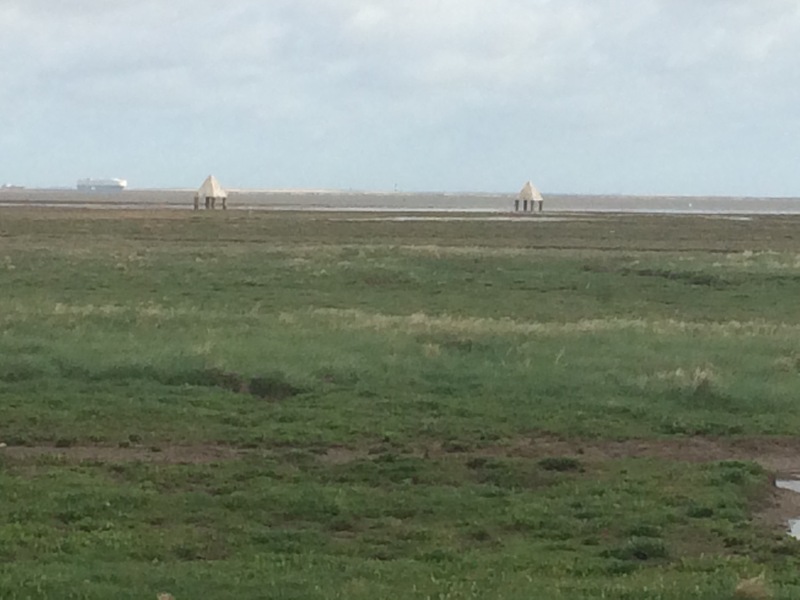 Unfortunately I walked past the one that is Britain’s first permanent cloud watching outpost at Anderby Creek, but these are a couple of the others. There were few establishments open and little to see on a wet and windy Tuesday in May. As the morning became afternoon, the predicted gales arrived and blew each shower away as quickly as I could put my rain jacket on. But boy was it windy. The last few miles took ages and I had to use my walking poles as outriggers to keep me upright, one for when the gust blew and the other side for when it stopped. Despite the gales it was actually quite warm and muggy; I attracted plenty of stares from dog walkers in my shorts and t-shirt. it’s a bit black over Bill’s mother’s and it’s too late for a hairbrush! 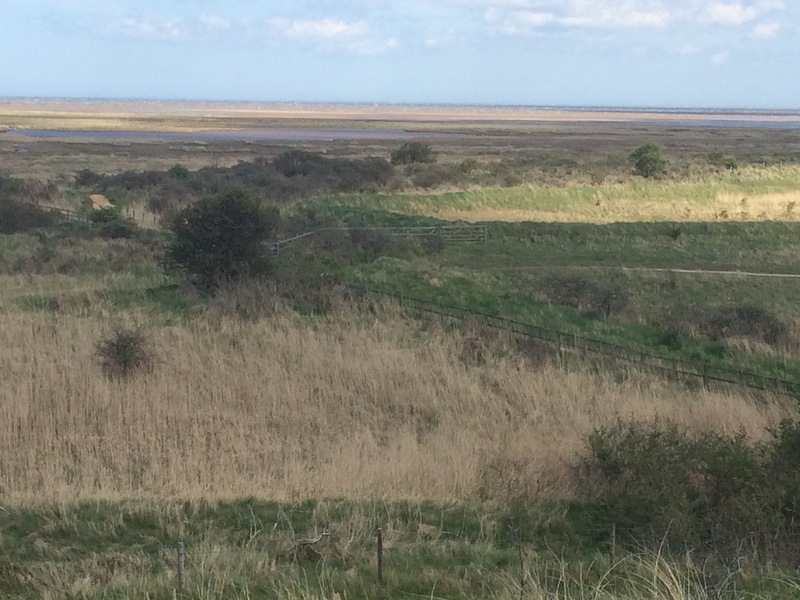 The last section of today’s walk took me through the Saltfleetby-Theddlethorpe Dunes National Nature Reserve. A beautiful place that was, like most places, created by man’s interference. 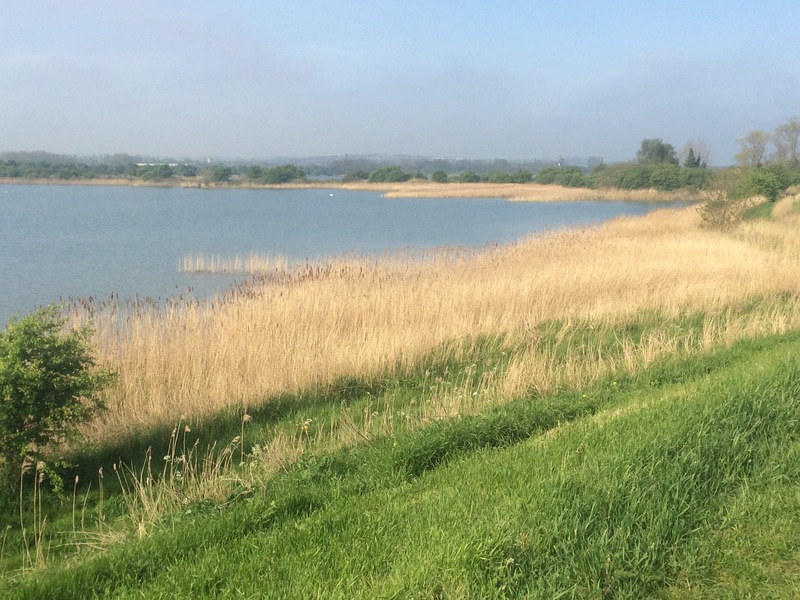 This time it was in the 1400s when the Haven was straightened to aid shipping access to the important port of Saltfleetby. This caused extra dunes to be created. 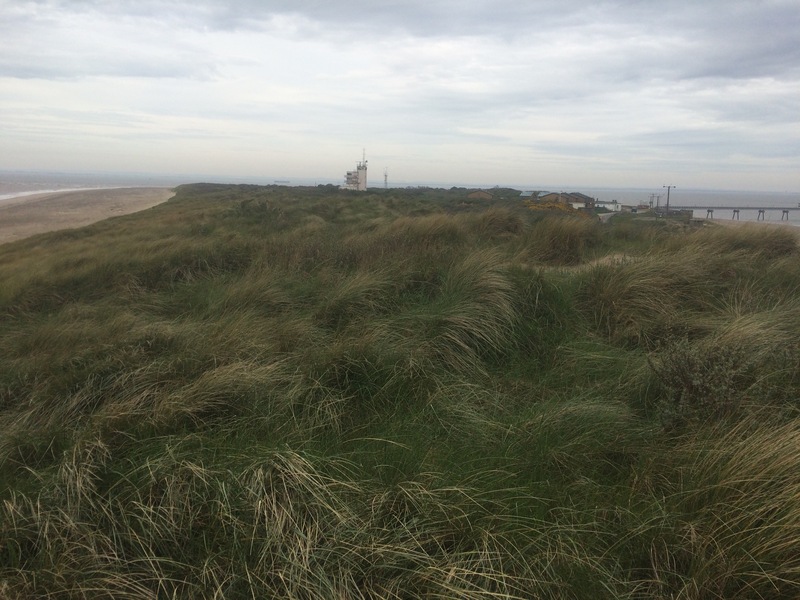 The dunes continue to grow as, contrary to the beach depletion further South, here is where the sand from Yorkshire is brought via the effect of longshore drift. I arrived at my accommodation at 3.15pm only to find the pub didn’t open until 5pm so I walked back to the local supermarket where there was a cafe. That was shut too, as was the other pub in the village. Saltfleet was closed for the afternoon! Saw this sign, maybe it explains a few things. After my 2 days at home I decided to catch the train to Skegness (referred to as Skegvegas by Gareth, who comes from Lincolnshire so I’m taking his word for it). This was in preference to starting back in Boston; the route between the 2 towns did not look overly appealing as a good portion would again be away from the coast. I did consider walking South to Gibraltar Point at the mouth of the Steeping River, which boasts great views across The Wash. However, after negotiating my way from Skegness train station to the sea front I didn’t have the will to walk through Skegness twice. There were a lot of people, well I suppose it was a Bank Holiday and it was sunny. There were also a lot of fish and chip restaurants, cafes and kiosks, and there were queues at nearly all of them. I was tempted but I’d eaten my chicken sandwiches on the train so really ought to do some walking before my next meal. 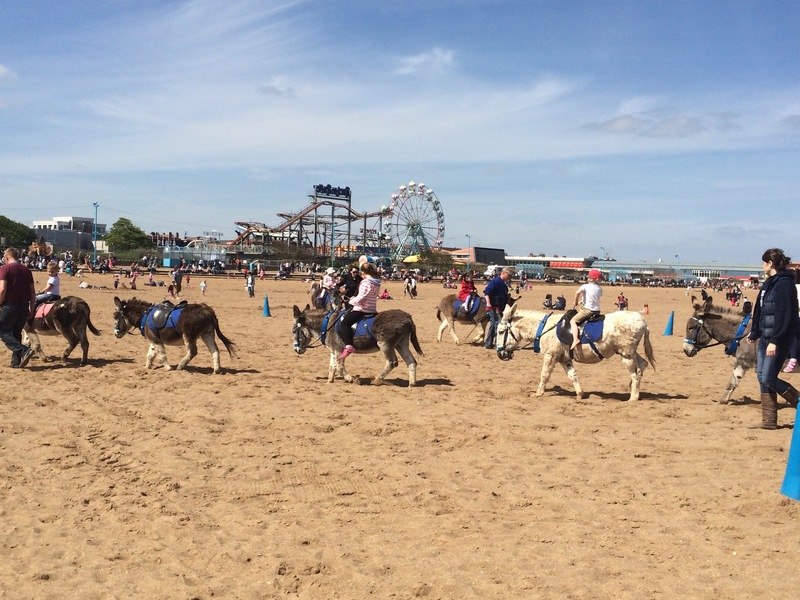 I’m now expecting the stares when I walk through big seaside towns and Skegness was no exception to my rule. An interesting place, very noisy and colourful with lots of funfairs, cafes and tattoos. I saw my first donkeys. I avoided the clamour in the town and walked along the beach instead. The tide was out and the North Sea was back to the usual dirty brown colour I associate with it. (It seems to me that wherever the East coast actually faces East the sea is brown and where it faces North, the sea is blue.) It was a pleasant walk up the beach, past Ingoldmells, to Chapel St Leonards. With the tide out there was plenty of golden sand and quite a lot of people taking advantage of it. Chapel St Leonards was the start of ongoing work to improve the sea defences, and the beach, by increasing the amount of sand at the beach. Diggers were in operation and the beach closed. 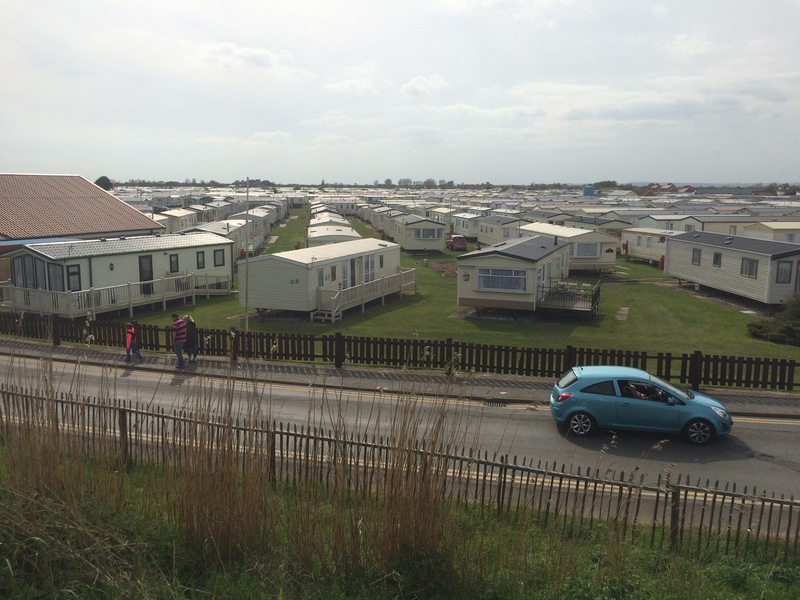 The main thing about this stretch of coastline was the number of static caravans. I thought I saw lots on Mersea and in Norfolk, but the parks here are incredible. Huge. There are even funfairs and supermarkets dotted about amongst them. My accommodation for the night feels like a lone building in a sea of caravans. Strange. How do you know which one’s yours?